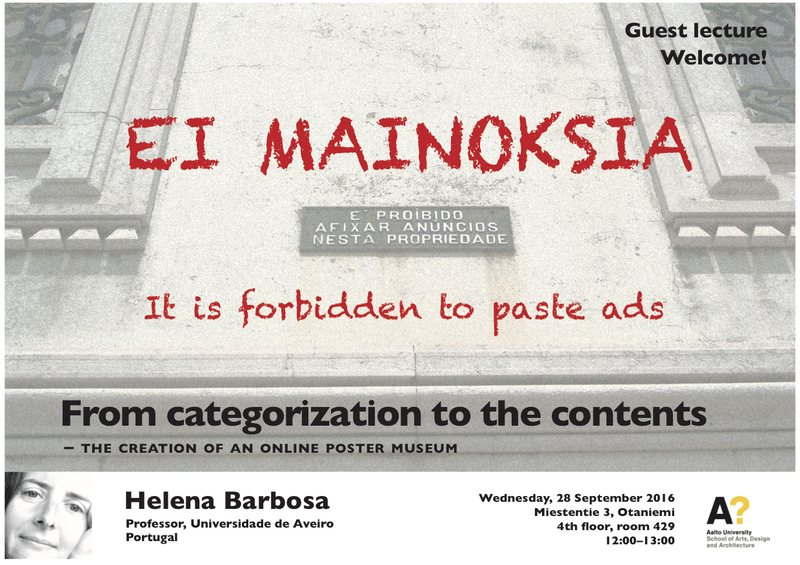 The University of Aveiro is at present developing a project involving the construction of an on-line poster museum, containing around 30,000 artifacts. Given the large number of posters in existence, and the great diversity of representations, this lecture describes the development of the project and the reasons behind the creation of “key topics,” which function as gateways to other related information on the web – metadata. It also presents the proposed key topics, considered as a tool that allows the visitor access to contents, not only from the perspective of traditional classifications and catalogue, but also from the point of view of design. It is presented a methodology that intended to privilege narratives over rules. 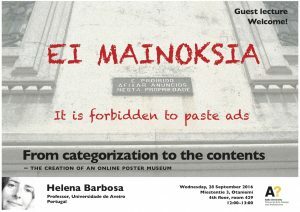 In this case, narratives about the poster were made by ten designers when confronted with a request to select 44 posters among 1,962 samples of posters obtained from the collections of the National Library of Portugal (Biblioteca Nacional de Portugal) and from the University of Aveiro. The designers discourses, were analyzed, through the theoretical design model developed at the University of Aveiro, revealing each artifact relation inside the triangle authorship / technology / brief, its morphogenetic evolution and semantic dimension. Taking into account those contents the research aims to create an on-line poster museum to be accessible worldwide and contribute to the knowledge of the history of Portuguese design. 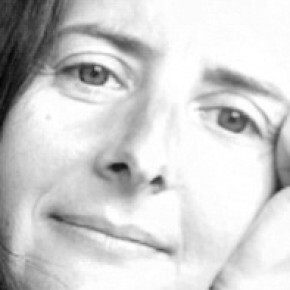 Helena Barbosa is a Professor of Design at the University of Aveiro, with interests on Portuguese design history, material culture, museology, museography, illustration and art. In addition to working with master’s and doctoral students as a supervisor, she has written extensively and has been invited to give lectures at national and international conferences, with articles in scientific journals, publishing several books. She is currently the keeper for the contents of an on-line poster museum, vice-chair of ID+ Research Institute in Design, Media and Culture, member of the editorial board of various international journals, and member of ICDHS. This entry was posted in Design, Lecture on September 19, 2016 by Saara.